... been changed since the defenestration of the Saddam regime? The flag and arms no longer have the three green stars. It has been one month and seven days already, with nobody even saying simply NO, THE IRAQI INSIGNIA HAVE NOT BEEN CHANGED. I'm interested to know the answer to this question myself. It's my assumption that the U.S.& coalition forces who have trained the new Iraqi army and police would have wanted to create a viable NCO structure, something that was apparently non existing prior to thier defeat. I'm thinking they would have wanted to create it in thier own image. Aren't there any vets maybe an X-trainer out there who would enlighten us? This is the Iraqi Police Insignia it is exactly like their military but different colors. The insignia of the new Iraq is mostly the same as the old Iraq. Minus Saddam's field marshal rank. It appears there will be a multitude of cammo patterns for awhile. Yet another country that uses an essentially British pattern for officers' ranks. Interesting. Yes Iraq has always used the British pattern to one extent or another. All the Arab countries use the same patterns, but with minor changes or iterations. The biggest changes are usually monarchical or republican devices for the national symbol. Crowns or eagles. Then whether to have two stars or one star between the full general and lieutenant general grades, which effects the major general grade as well. Then which direction the swords will face. Another from the new formet. I essentially modified some uniforms from a devientArt post. I track down to credit. DarthGaddafi wrote: Another from the new formet. the chart reminded me of something I've been wondering: did syrian ba'atists ever used political insignias like the iraqi ones ? 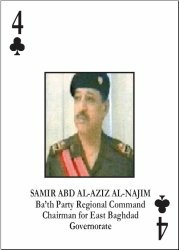 Also, did the iraqi ba'at party member beside the three in the chart use any form of uniform or insignias distinct from the republican guard/army/police ones ? Marc, concerning Ba'ath - there is some chart of rank insignia here, in our favorite Encyclopedia - http://www.uniforminsignia.org/?option= ... esult=2138. Dorward_Bis wrote: Marc, concerning Ba'ath - there is some chart of rank insignia here, in our favorite Encyclopedia - http://www.uniforminsignia.org/?option= ... esult=2138. Thanks, I had seen those. I was mostly wondering about the rest of the ba'athists. Normally regime that put their dignitaries in uniforms have an habit of doing the same to other members so I was wondering since I've only ever seen those 3.
while trying to find more info on the ba'athists, i noticed that the insignia identified as being for the deputy prime minister in the encyclopedia was worn by others, all of whom were regional command chairmans of districts.